Worldwide human health disorders are increasing in volume, they are diversifying; accelerated climate change, population movements, new diseases with uncontrolled evolution and the antibiotic-resistant super-sensitive bacteria are the biggest challenges of the moment. In this context the implementation of the One Health Concept must become a national security objective for the balance and good functioning of society and for life as a priority, as the action is being addressed frontally in the US and now in the EU. Internationally, the One Health New Medical Concept Association, in fact, represents Romania at international congresses, to conclude international agreements in Brussels, at the European Federation of Medical Academies (FEAM) and does it with responsibility and success. At European level, the Association received from the European Federation of Medical Academies (FEAM) the opportunity to promote the One Heath Concept at the South-East and Central Europe Region and also to start the research on One Health issue, an unique responsibility for a Romanian body. 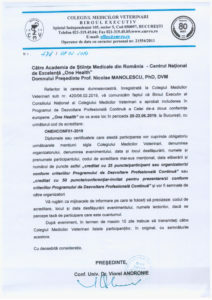 In this very context, in June 2017 the Association concluded a Partner Agreement in Budapest with the University of Veterinary Medicine from Budapest (ranked 6th in the world) for the joint organisation of One Health 2018 Inter-regional Conferences in Bucharest and One Health 2019 Inter-regional Conferences in Budapest. The Association successfully organized the European Inter-regional Conference One Health 2016, Bucharest and the National Conference One Health 2017, Tg. Mures. Following the agreement concluded in Budapest with the University of Veterinary Medicine Budapest they will together organize the European Inter-regional Conference One Health 2018 in Bucharest and the European Inter-regional Conference One Health 2019 in Budapest. The One Health Association New Medical Concept is a private non-profit legal person, apolitical, founded under the law on associations and foundations. The income of the Association it comes from donations, sponsorship’s and the development of projects. A very important founding source are the projects funded by European funds, unfortunately, since now, projects prepared by approx. two years, can not work because the European funds 2014-2020 are blocked. Significant sponsorship’s have not been achieved, excepting the Spiru Haret University, with which a special partnership program is being carried out: supporting current activity, substantial support for the European Conference One Health 2016, launching the European Cluster for One Health Postgraduate Courses, hosting the European One Conference Health 2018. – Running One Health projects, just mentioning antibiotic resistance, zoonoses, and One Health Excellence Center. – Traveling abroad to conclude international partnership agreements in the spirit of promoting the One Health Concept in Central and South Eastern Europe. The importance of promoting and implementing the Concept is a certainty and, on the other hand, in many, many of the actions and projects mentioned, the Association represents Romania. Professor Emerit H.C., Doctor H.C.